Yes, it’s already been THREE MONTHS! I know that three months is nothing in the scheme of things, and even three months out of 2016 doesn’t feel like an incredibly long time, but to me three months is a lifetime. When things don’t go right or you have problem after problem, even a week can feel like an eternity. That’s what I was experiencing before I had my hospital admission in August. I was trying my best to deal with what was happening to me at the time – codeine addiction and subsequent withdrawal (OMG), bile salt malabsorbtion, unable to eat, violent diarrhoea, generally feeling like my Crohn’s was worse not better for having had a right hemi colectomy – and I was just not coping. I was finding each day a struggle until after about a month I had had enough. I demanded – with all the willpower and strength I had left in me – that my IBD nurse admit me to their ward and sort me out. And sort me out they did, by taking my colon away and giving me a permenant ileostomy. ‘Ileostomy’ was a terrible word to me. Was being the operative word. This was back in 2011 and 2012 when I finally got diagnosed and I met other people with IBD. An ostomy was by far one the things that freaked me out – along with fistulas, which still do, to be honest – and I did everything I could to ignore that and prayed the drugs worked for me. That I would never need to have surgery, medication was going to keep me going and going and going. My personal goal was to go at least 10 years without them needing to cut me open, but the longer I had Crohn’s, the more drugs I had to take, the more things started to work against me; the more I rrealsied that 10 years was wildly optermistic and 5 years would do me. Five years would be late 2016 into 2017, I could cope with that as my new goal. Of course things didn’t work out like that. I managed until December 2015 until surgery was mentioned and I was ushered into see the top colorectal surgeron at my hospital. He is wonderful and lovely but my god, seeing a surgeron is a scary business. But they do look after you, from start to finish. 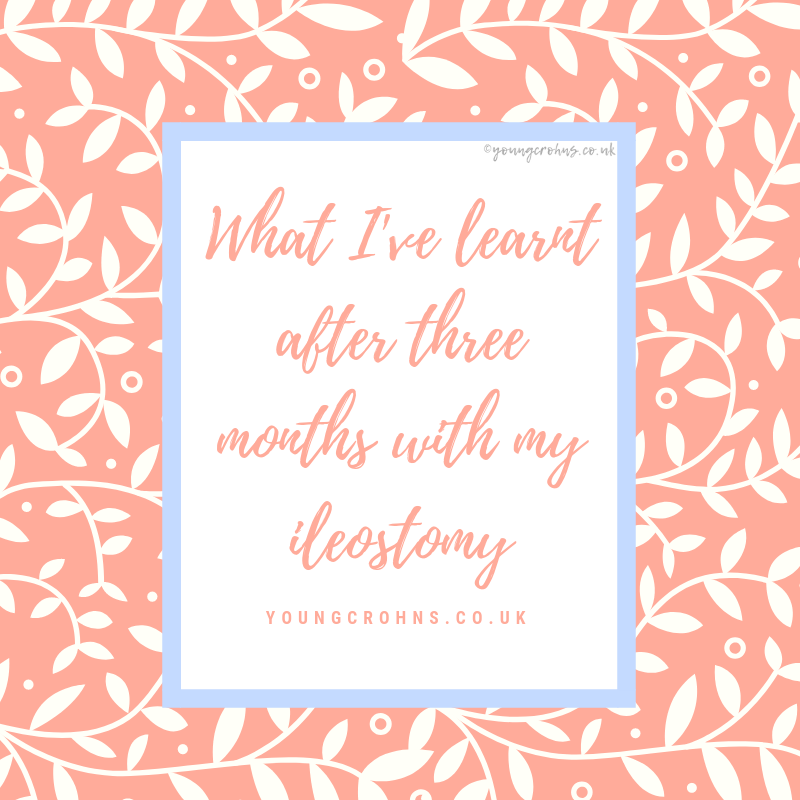 So despite him doing a right hemicolectomy in May, I still needed more surgery and this time it was going to be bigger and badder; it was going to be my worse nightmare: an ostomy. That being said, I did really want the surgery when it came down to it. When it was discussed as the best outcome to what I was going through and I should take time to really think about it, ask all the questions and see the stoma nurses to be prepared for it; I had already made up my mind. It was going to provide me with a remedy from what I was going through; all that pain would be gone! Yes, it was a dramatic and big change and I won’t deny it wasn’t a challenge in those first days in hospital or even the first couple weeks after discharge but it has changed my life for the better. Well, having an ostomy means have my digestive system rerouted. It means I poo out of a cut in my abdomen where my small intestine comes out – called a stoma, mine is personally called Pricilla because she is a bloody drama queen! – and is collected in a bag attached to my skin. I empty it up to 8 times a day and change my appliance – my ostomy bag – every two days. That’s the basic physicalitly of it and that I cope with fine. Seeing it for the first time – when I was weak, on TPN, unable to bend and be as active as I am now because I was 4 days post op and sore from my midline incision – was weird and very draining. She was red, swollen and ugly. Now she is smaller, formed like a proper bit of bowel and behaves because I know when she is active and inactive. I’ve learnt how to change my bag myself. I’ve learnt how to deal with bag leaks by myself. I’ve learnt how much time I have to change my bag and what to do if she suddenly misbehaves. I generally have a chat to her when she pisses me off, its a quite strange relationship to have but its my coping mechanism plus it really makes me laugh and provides me with some silly titbits for my family to listen to later on. I’ve learnt how to conseal my bag under clothing. I’ve learnt how much pressure I can take lying on my side with my stoma. I was afraid when I first got it I would never been able to lie on my right hand side ever again – its my favourite side to fall asleep on – but I can do it now. My stoma tells my body when to move and I just have to listen. I’ve learnt to listen better to my body. It tells me what I need – more water, more salt, more sugar, more fruit, less fibre, more starches, more walking, when to get up and empty, when to change… it’s amazing how much I crave now in a good way because I am getting better nutrition. Having this ostomy means my food no longer goes through a damaged and inflamed colon so my variety is greater and I enjoy eating and finishing meals. Hallelujah! I’ve learnt to not ignore going to the loo. It is a much easier and more conscious effort now. It takes hardly any time at all these days! I’ve learnt I need to look after myself. I am my number one priority, over everything else. I’ve learnt what I want to get out of life now. I wasn’t lying when I said it had changed my life, it really has. I’ve learnt I am stronger and more resilient than I could have imaged. Two surgeries in one year! Two surgeries in three months! I survived all that and remained positive! Big girl pants achieved and brownie points rewarded. I’ve learnt that this learning experience isn’t over and won’t ever really be over. And that is okay. I am fine with these challenges because I know I can do them, whatever my stoma throws my way. With that, I’ve learnt how to deal with a blockage. Big big BIG points awarded for that. I’ve also learnt that new doors are opening all the time. What else do I want to with my ostomy? I’ve already seen that my ostomy doesn’t hold me back; I’ve already achieved quite abit and its only been 12 weeks. So what else is in store? What else would I like me and ostomy to do? NB: This is an permanent ostomy so this won’t ever be reversed. I currently wear a convex bag and I would love to finally be able to get back to a flat bag. I want to experience my ostomy abroad so travelling my airplane. Trying to holiday alone and see how I cope on my own. Bathing without my bag on; I currently do it with my bag attached.. this is mostly a logistics issue. Exercising and trying out a new hobby – possibly swimming more or snowboarding again. Having a photoshoot done to capture me and ostomy in all our glory. Previous Post Day Twenty Seven – Sunday Selfie! I hate it . One month in and I’ve cried and thought bad thoughts about not wanting to live .. specially at two in the morning when it’s leaked over my bed …. but it’s saved my life and rid me of my cancer ….. still having difficulties… and nsh stoma nurses are no help ..